Faith has the misfortune of a fall birthday. Don’t get me wrong, fall is my favorite season (besides beach summer of course) so it is not the weather that is bad. The reason fall stinks around these parts is because summer is always a slow money time for me. When I was teacher, I flat out didn’t get paid in July and August. Now that I’m in sales, business is at it’s weakest (as am I as a businesswoman) when the sun is high in the sky. I am telling you this as a way of explaining the origins of the simple birthday party. Because it was not born from some noble stand against popular culture, but rather we were too broke to hire a clown or rent a gym. That is right, we are not members of the Birthday Blowout club. In fact, we have only been to maybe one Birthday Blowout in our seven years of parenting. Most of our friends subscribed to the less is more theory too. I have read about American Girl parties and circus tents in the backyard but I have never seen one up close. We have been blessed with lack of excess. After we threw our first birthday on a budget party, we realized what our friends seemed to know as well-some cake, some friends and a few hours of playing and everyone leaves happy. So our kids have just that every year-a few friends over to our house (or no friends and chuck e cheese) and very little fanfare. The simple party looked deceptively un-simple this year. Faith had herself a proper tea with mom and grandma’s china and linens. The guests were invited about 4 days before and luckily they all could come. The ladies were dressed for tea and seated by the properly suited Maitre d’. Each had a cupcake. When tea was finished I changed from my waitress outfit into my beauty coat and opened the salon. Each girl left with a fresh manicure and their very own Mary Kay lipgloss in, of course, hot pink. It was fantastic. The kids loved it. The moms raved. The birthday girl was over the moon, as were her parents-because all this joy cost a mere $40-definitely within the end of summer budget. **That cupcake tower toppled over about two minutes in. They still ate ’em. Phew! *** The girls hated the special (fruity)tea but loved the sugarcubes! The very smart Maitre d’ offered water with their cupcakes. Fantastic idea. Mark and I say if we ever have kids we aren't doing the whole huge birthday party thing. 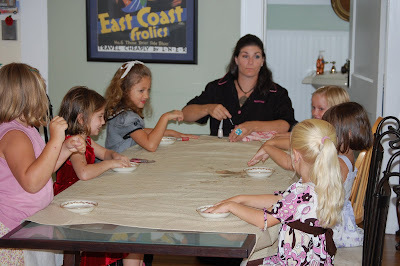 You prove that you can have a great birthday party without a lot of fanfare and on a budget! PERFECT! p.s. your daughter is quintessentially beautiful. is it incredibly shameful to be envious of your 7 year old's bday tea party? what a blast this was, great job, mom!!! and seriously, can you get better than a manni (sp?) and cupcakes? Tea party, manicures, a flower delivery and the premiere of ICarly – what more could you ask for on your birthday? :) Glad I was able to celebrate with her.